I have made a few more Father's Day cards so I thought I would share them with you. These are A5 cards. I also made matching envelopes. I used whisper white, chocolate chip, soft suede and crumb cake. I don't usually use these colours so thought I would change things up! 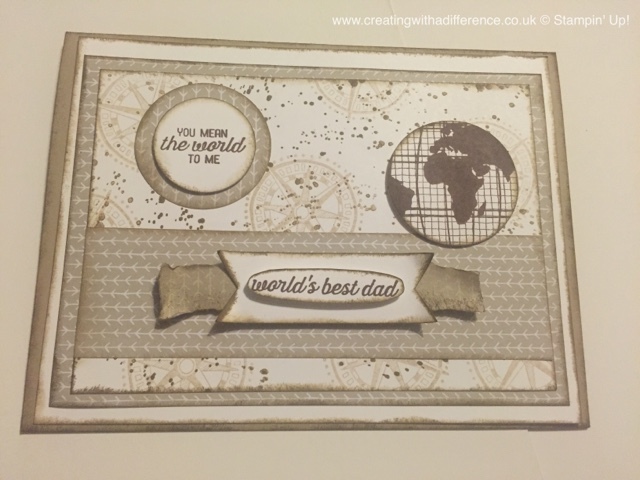 I also used the going global stamp set which has retired but I am loving it for this Father's Day. I used A4 cardstock and scored in half with my trimmer. I then added whisper white layers and retired DSP. I cut out a 2" circle on the first card and popped the world and sentiment images on the inside of the card so they could be seen from the outside as well. My layers were cut with 1/2 an inch shorter and narrower or 2.5 cm. SOme layers I trimmed off a bit more to add a different sized border but it's up to you how you like your borders on your cards. One base was white and the other was crumb cake. I used gorgeous grunge to add some texture and interest to the cards as well. 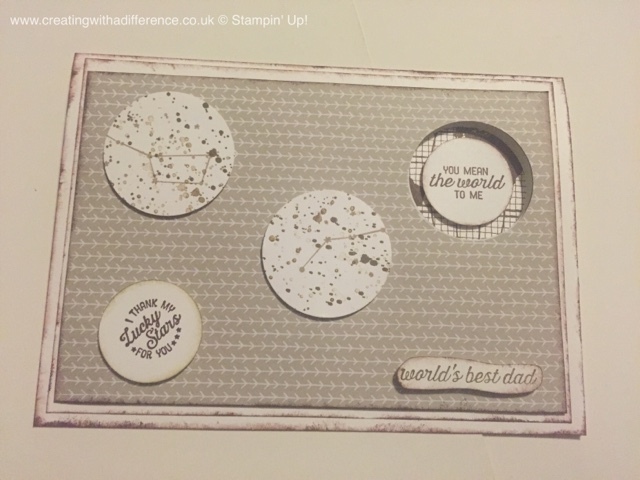 I used the constellation stamp from going global as it fit nicely with the sentiments I chose as well. Some of the second card has added texture with the torn DSP. I also sponged everything with my colours I used for stamping as well. I really like the grungy texture and rustic look of this card. I don't usually use these colours but I will be from now on. Grandad really like his card and hubby loved his too. Ernie (our dog) and the pigs gave Daddy their card and gifts this afternoon and he was overjoyed as always. He even got kisses from nearly all 8 of the furry babies which I am impressed about. Grandad wasn't well so Mum dropped off his card and gifts and he was happy as well. So all in all a successful Fathers Day. My father in law should be getting his card and present tomorrow in the post so fingers crossed he is happy. Got to love it when a plan comes together.